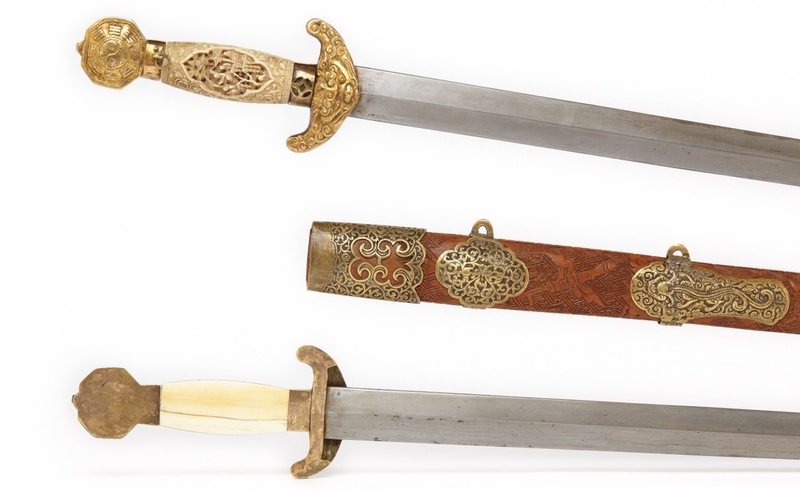 Presented is an excellent set of deluxe double straightswords, or shuangjian , with elaborately carved ivory handles, gilt hilt fittings, and fragrant wood carved scabbard in brass mounts. 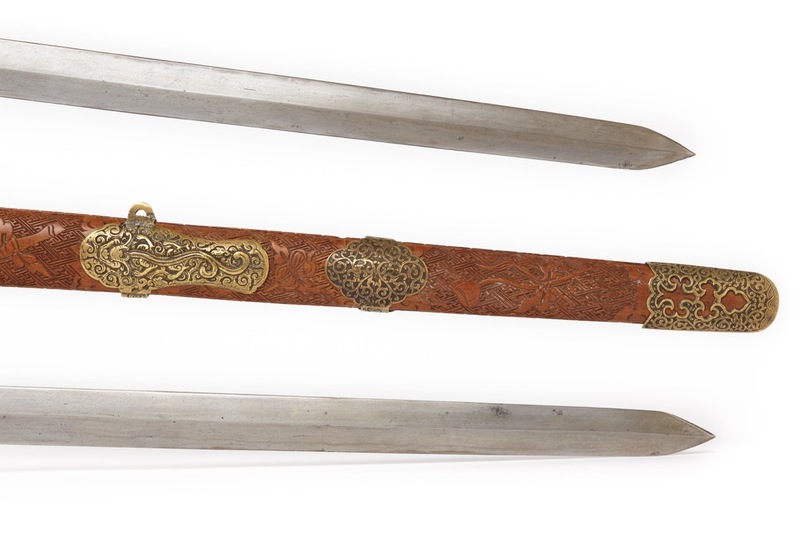 Sets of double straightswords are fairly common on the market, but very rarely they are this good. 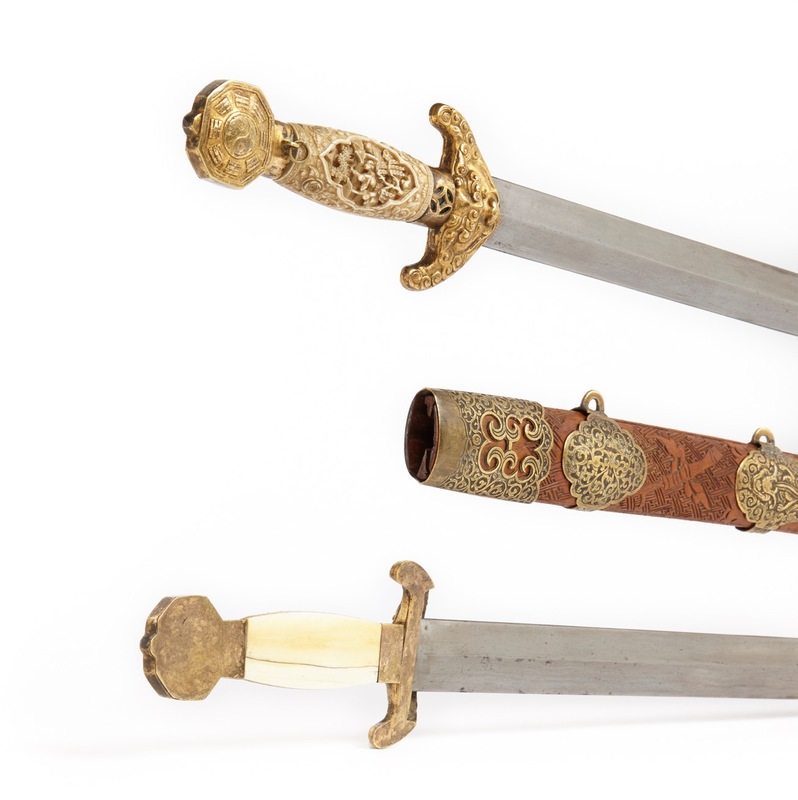 The most striking part of these swords are the intricately carved ivory handles. The handle outer surfaces are carved with designs of flowers and fruits over a fine diaper pattern of lozenges. The designs are framed by a greek key pattern, in each corner is a rose. 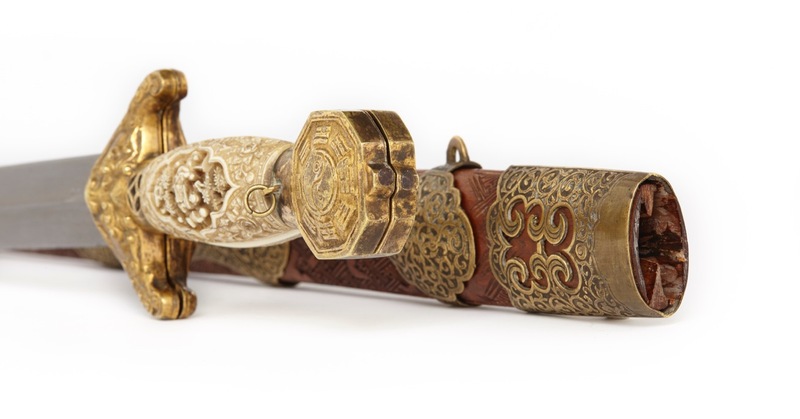 The center of each handle is deeply carved with scenes of scholars in a classical Chinese garden landscape. The designs are undercut so that the legs of the table, a tree trunk and the beam of a temple are completely cut loose from their surroundings. Each individual's face is meticulously carved with its own expression. 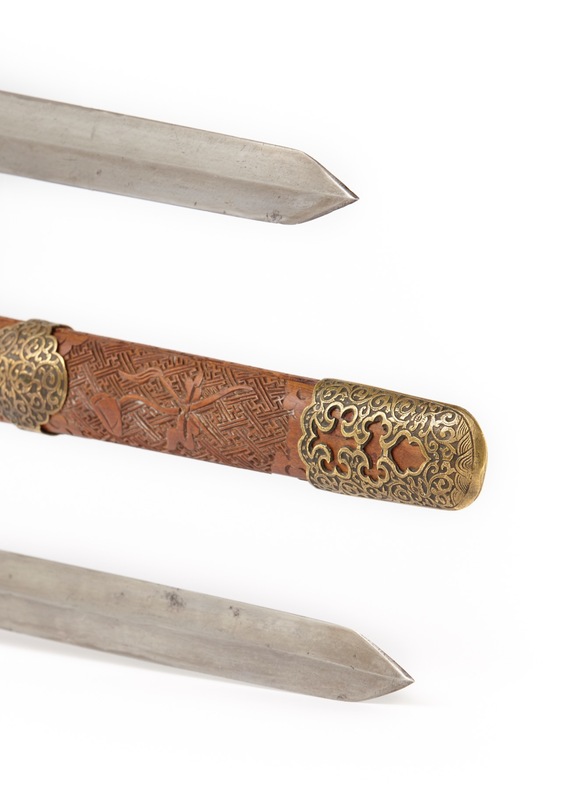 The hilts are of a type that is commonly referred to as "Taoist jian by virtue of the "Eight Trigrams" symbol on the octagonal pommels, around a taiji symbol representing the synergy between yin and yang . 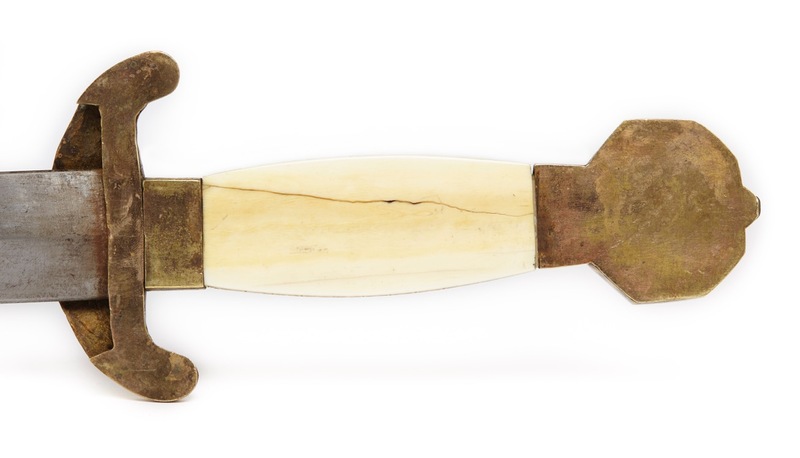 They are paired with a ferrule with auspicious coin shaped cutout, and typical zoomorphic guards with a taotie face from which the blade emerges. The taotie 's curling manes form the quillons of the guard. 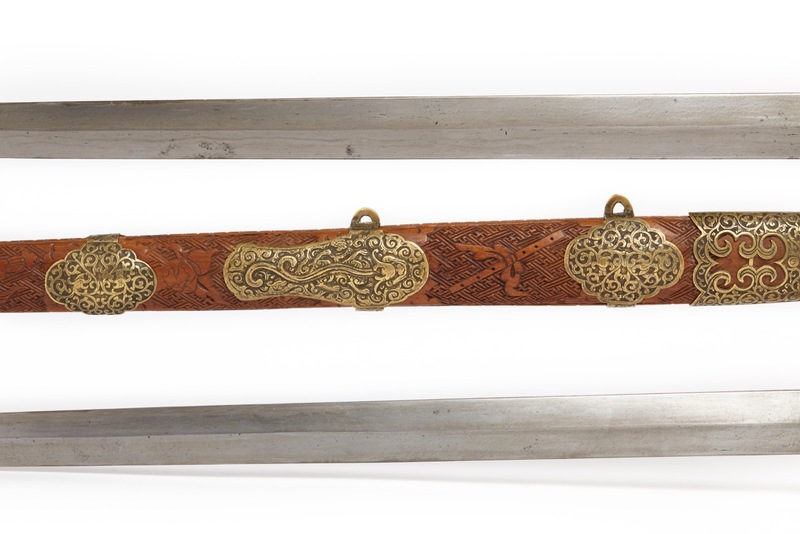 Each hilt is flattened on one side so they fit neatly in the scabbard, side-by-side, as if they are one sword when sheathed. 1. Flute of Han Xiangxi, the Patron Saint of Musicians. The flute resembles harmony. 2. Double gourd of Li Tieguai, which contains all magical medicines. 3. Sword of Lu Dongbin, the patron saint of scholars. 1. Bamboo drum and rods of Zhang Guo, the eccentric alchemist. 2. Fan of Zhongli Quan, the military man. 3. Lotus of He Ziangu, the female immortal, improver of health. 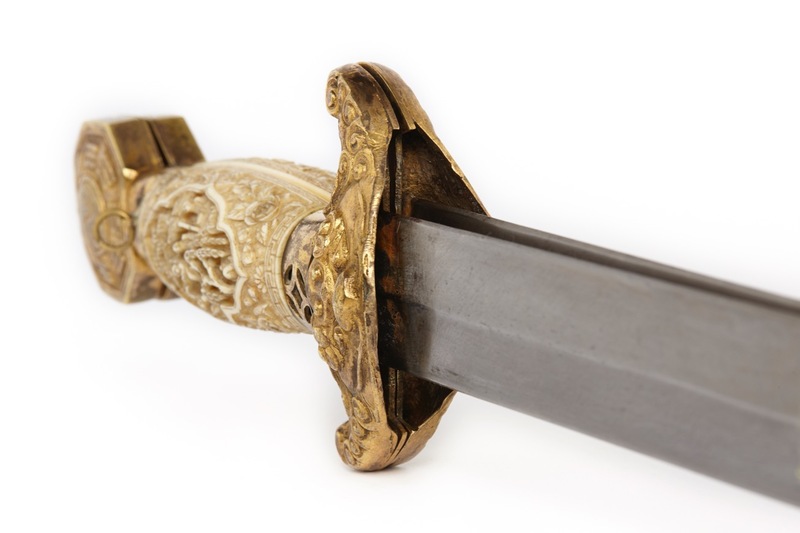 The scabbard fittings are of a fairly standard cast brass type and not gilt like the handle fittings. They were nevertheless "born" with the scabbard because the scabbard has plain areas exactly following the contours of these fittings. 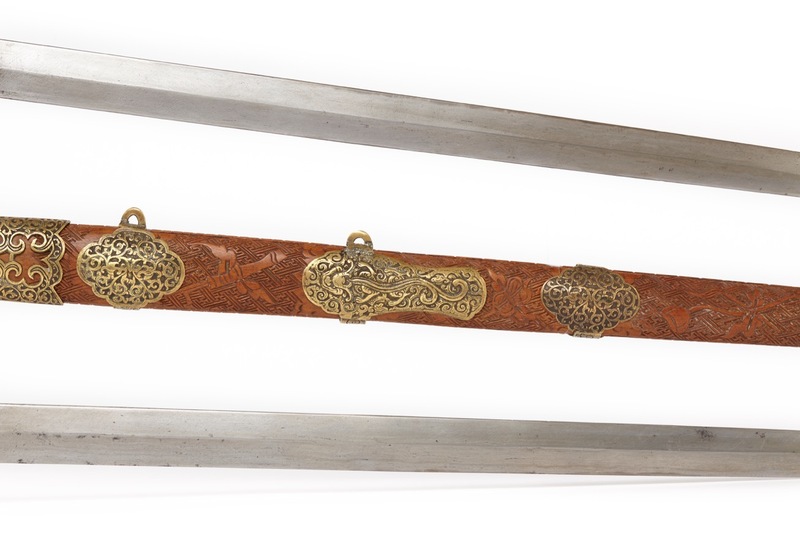 Both swords fit snugly in the scabbard, and each channel is made for a specific sword. They are not interchangeable. The quality is not only in the mountings, the blades are slightly longer and heavier than the typical set. They exhibit signs of forge folded steel and inserted hardened edges. 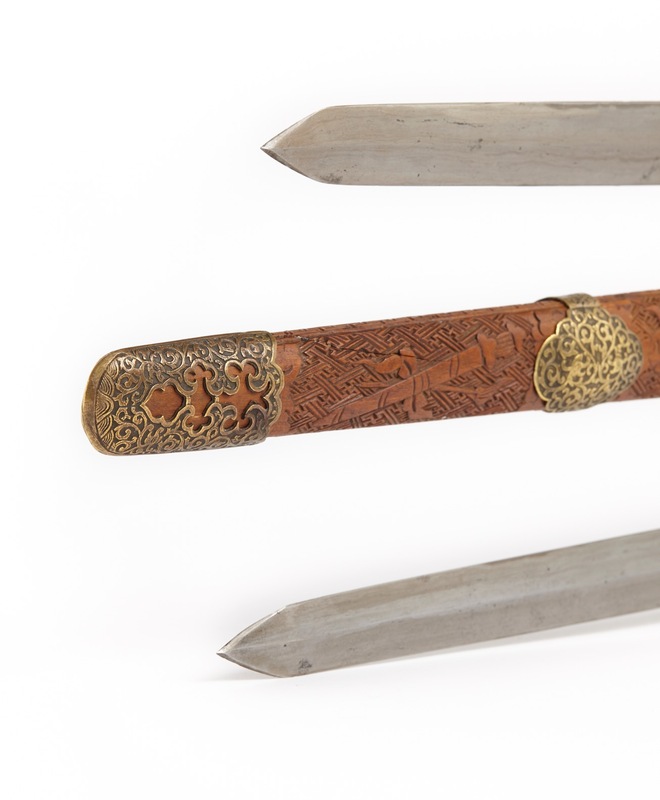 It may be made as mostly an ornamental set, it does have rather serious blades of stout proportions and with good tempered edges. Various examples of the type have surfaced over the years, but almost always with carved horn or wooden handles of lower quality. 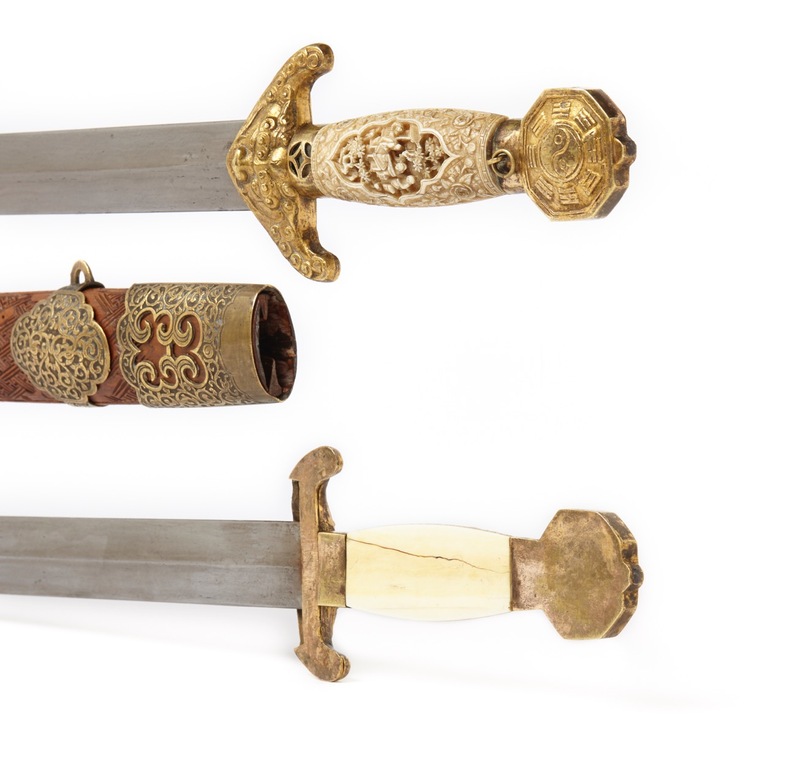 They come in two main varieties, one with cast scabbard fittings with archaic motifs like on this example, or with sheet brass fittings with stylized coin cutouts. 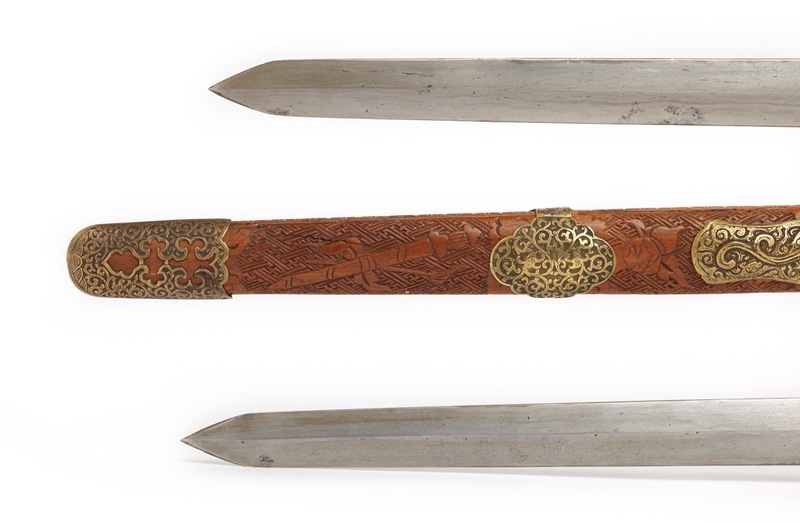 There is a set with identical fittings, including the octagonal Eight Trigrams pommels and cast brass scabbard fittings, but simpler ray-skin covered scabbard and less elaborate horn handles in the Metropolitan Museum, accession number 36.25.1480a–c. It came from the George Cameron Stone collection, bequeathed to the museum in 1935. 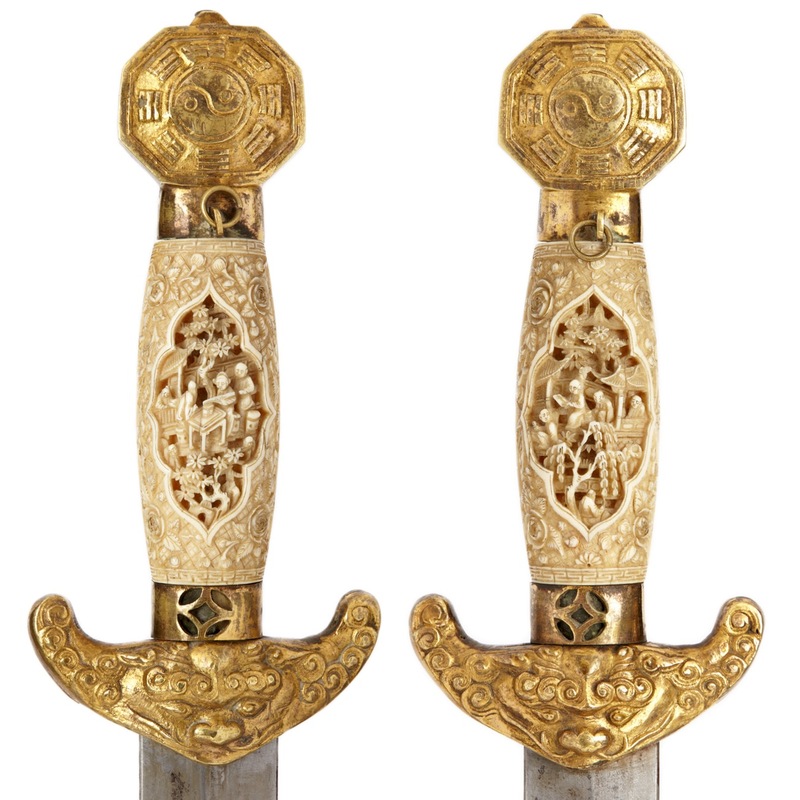 The only other example I know to exist with such carved ivory handles was published in Robert Hales' Islamic and Oriental Arms and Armour .4 This example is of the variety with sheet brass fittings with stylized coin motifs. 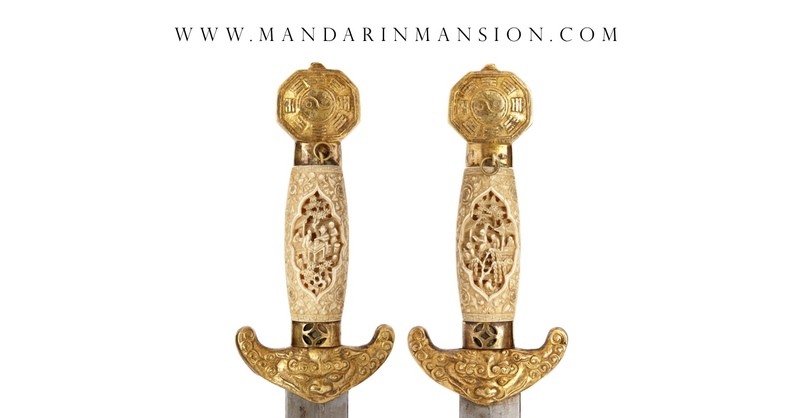 An magnificent set of Chinese double swords with intricately carved ivory handles. This extremely rare set is one of only two such sets I know to exist. 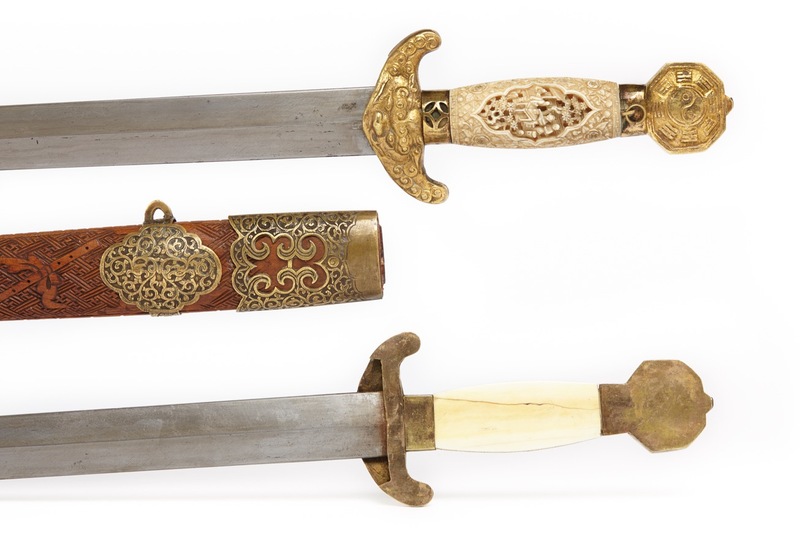 The handles were produced in the workshops of Guangzhou in the early 19th century, the work exhibited on these swords ranks among the best ivory carving from China. 1. Rose Kerr, personal communication at her book presentation at Sotheby's London, December 2017. 2. See Rose Kerr, Phillip Allen & Shih Ching-Fei: Chinese Ivory Carvings: The Sir Victor Sassoon Collection Scala Arts & Heritage Publishers Ltd, 2016. Pages 16 - 25. 3. Fabrizio Pregadio; The Encyclopedia of Taoism , Volume One: A-L, Routledge, London, 2011. Page 220. 4. Hales, Islamic and Oriental Arms and Armour. Robert Hales C.I. Ltd, 2013. To meet the demands of the Convention International Trade of Endangered Species (CITES), this object is sold with an appraisal document from a certified Dutch appraiser of the TMV Federation. 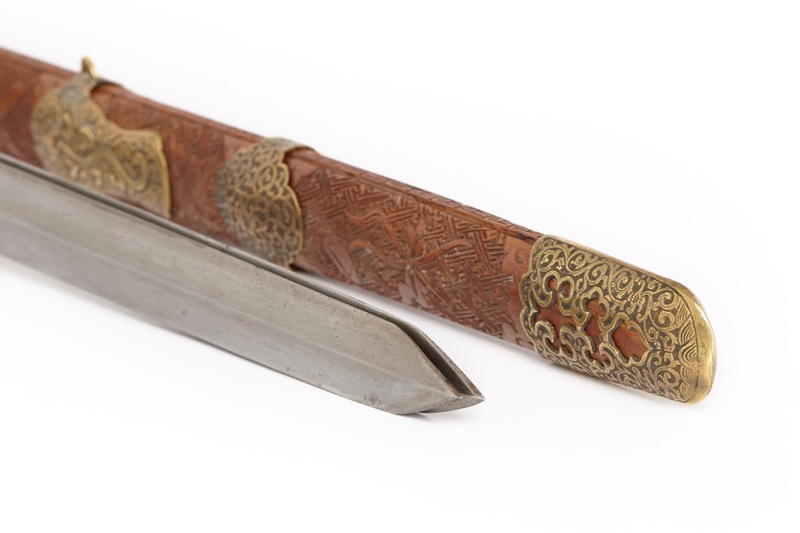 Among others, it states that the item is manufactured in the 19th century. 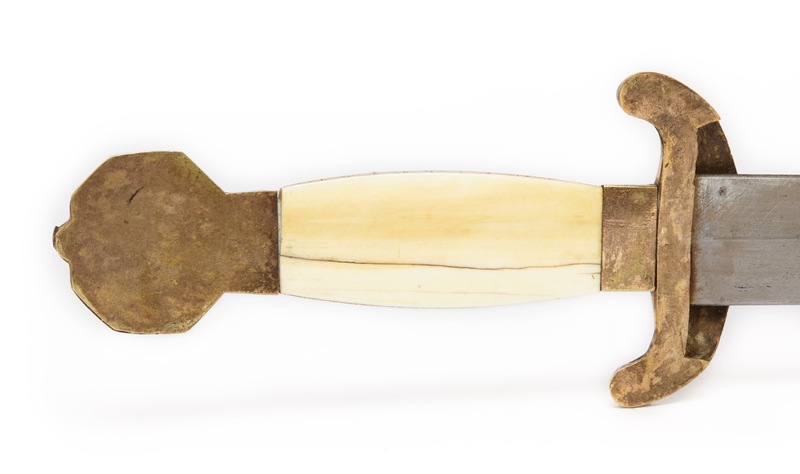 The handle is carved ivory of the species elephas maximus , listed on CITES appendix I.